Gas Fitter Basics displays alternate units of measurement when you click or touch numerical values. For example, click this value: 70 °F Some sections provide the option of using either the Imperial or the Metric system. See piping and venting The troubleshooting boards digital temperature meter can be toggled for Fahrenheit or Celcius. 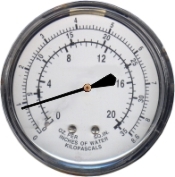 The pressure gauge shows scales in both systems.